Do you have a plan for Valentine's day? Anyway, today I will talk about The skin food Tomato Suncream. 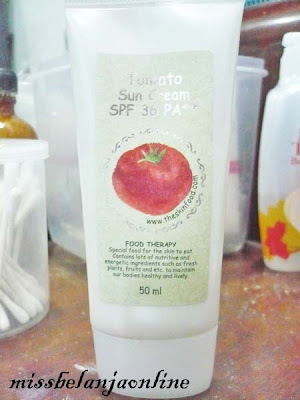 As you know I'm really in love with The Skin Food Tomato whitening serum (you can see the review here), that's why i try this sun cream. The tomato series from the skin food is useful for whitening. A sunscreen cream containing tomato extract rich in lycopene and various organic acids to protect skin from UV rays. It simultaneously blocks both UVA and UVB rays that cause premature aging of skin. 15-20 minutes before going outside, apply to exposed areas such as face, neck, arms and legs, avoiding eye areas. If outside for extended period of time, reapply as needed. I used this suncream for almost 4 months. I can’t tell that I love this sun cream but I can’t tell that I hate it too. This is quite confusing he5. This sun cream is from tomato range which mean it is can bright my face. I agree with that, because I found my face is more brighter after 1 months using this sun cream. I don't like to use this in the morning when i'm in a rush to office because this is really hard to blend (the cream is really thick) if I don’t blend slowly it will left me a white cast. Hard to blend because the cream is very thick. Reccomended: Overall, it is an OK sun cream. If you looking for something cheap, fit for daily use, and want to have a brighten face, I think you can try this. Repurchased : No, I prefer to try the other sun cream. sorry :( maybe next time i will host an international one.. Thanks for stopping by at my blog..
What is your favourite sunscreen to date?